1932, Born in Montreal, Canada. Born in Montreal, Canada in 1932, Glass’ father was a golf-pro who, for inexplicable reasons, invented a square golf ball, a fact that amuses the artist to this day. Interested in pursuing art he moved to Paris in 1953 to attend the École des Beaux-Arts. He soon embarked upon a more bohemian life and, after meeting André Breton, regularly participated in surrealist activities. The friendships he formed with the Surrealists at that time had a profound effect on his life and work, and he still spends several months a year in Paris. 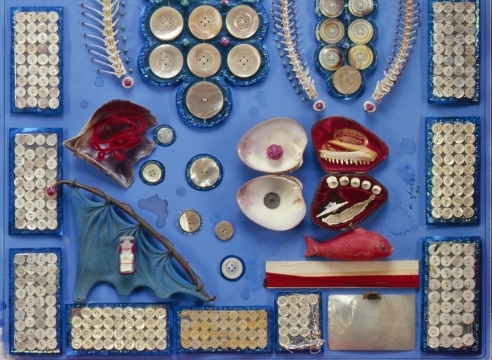 He became particularly close with Breton’s daughter, Aube Elléouët; her collage and assemblage works, in addition to those by Mimi Parent, inspired new directions in his own. During the decade he spent in France, in spite of great poverty, he traveled widely in Europe and the Middle East. A gift of a fantastically decorated sugar skull, made for the Day of the Dead celebrations, inspired in him a great desire to visit Mexico, which he did in 1962. He became so enamored of Mexico that he returned the following year, and in 1970 made it his permanent home. Another of Glass’ close friends was the playwright and filmmaker Alejandro Jodorowsky, who in the 1960s and ‘70s was working in Mexico. Jodorowsky was involved in the occult—he played an alchemist in his 1973 film The Holy Mountain— and while in Mexico began working with the British Surrealist Leonora Carrington, who had been living there since 1943. Through Jodorowsky Glass met Carrington and the two have been inseparable ever since; they still live a few blocks from each other." 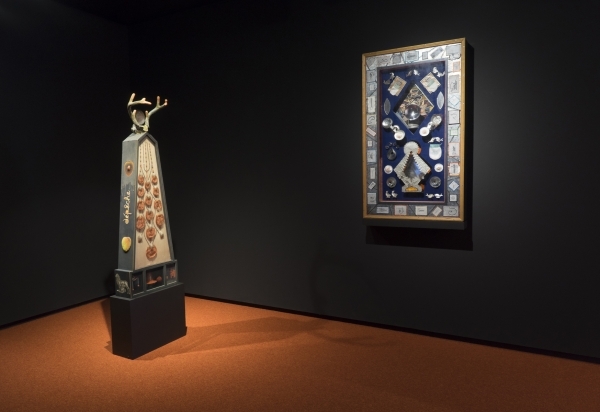 Long aligned with the surrealist movement through artistic temperament and close personal friendships in both France and Mexico, Glass’ drawings and sculptural constructions nonetheless appear strikingly contemporary. His arresting juxtapositions of words, objects and images, although deeply indebted to Surrealism, are also reminiscent of Pop and postmodern appropriations." For decades the artist has scoured flea markets and curio shops, collecting objects that bespeak of the 'marvelous' as articulated in Breton’s first Surrealist Manifesto of 1924. In Paris, Mexico City and other locales Glass has sifted through the material detritus of culture with the dedication of an antiquarian and the eye of a poet, carrying home treasures both mysterious and ordinary. In his studio he combines these items with the precision of a clockmaker so that it is sometimes impossible to tell where the found object ends and his 'assistance' begins. Extremely labor intensive, these works nevertheless possess the artful haphazard nature of a carefully constructed poem. Placed under bell jars or in glass-fronted boxes, they combine the theatrical air of carnival attractions with the melancholy of old and moldering natural history displays." Review of “Zurcidos Invisibles: Alan Glass Construcciones y Pinturas 1950-2008” Museo de Arte Moderno, Mexico City, November 27-December 12, 2008. Alan Glass's work is in international collections including the Musée d’Art Moderne de la Ville de Paris (France), Museum of Modern Art in Mexico City, the Montreal Museum of Fine Arts in Canada or the Metropolitan Museum in New York, USA, among others. Authors: Masayo Nonaka (Author) and Alan Glass (Artist). 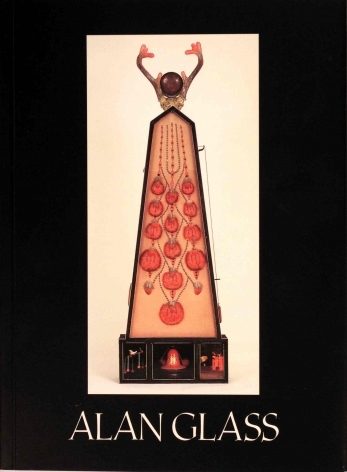 Pages: 340 / Color images / Format: 24,5 x 33 cm / Binding: Cloth and dust jacket. "VARIACIONES SOBRE TEMA MEXICANO", Iberdrola Tower, Bilbao, Spain. Group exhibition from May 13 until June 30, 2016, curated by Guillermo Paneque.